“Young Lady, you need to have the gravy with that.” I am told this by Dave, a retired Coast Guard chief who sits down the bar from us. 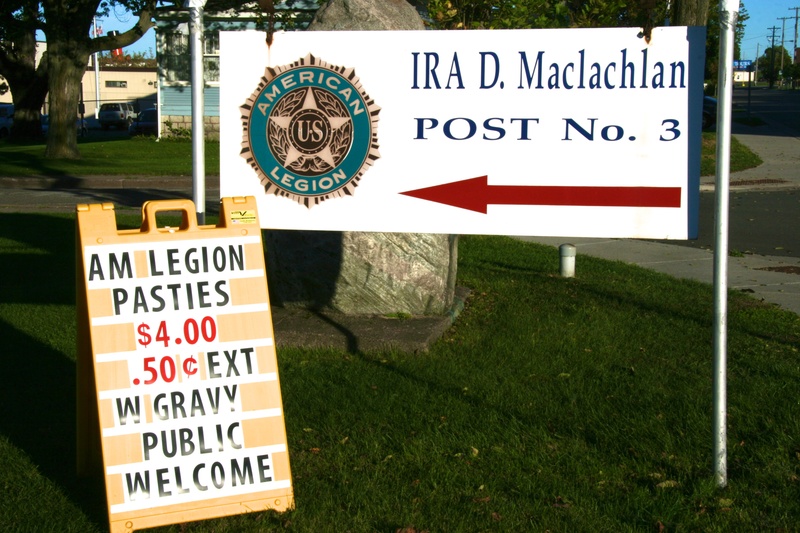 He is pointing to the pasties (pronounced pass-tees) that drew us into The American Legion Club in Sault Ste, Marie, Michigan. Since 1855, massive locks here on the St. Mary’s River have allowed freighters to negotiate the passage connecting Lake Superior and Lake Huron. Coal deposits in upper Michigan attracted Cornish miners to the area during the 1930’s and they brought hearty hand pies called pasties with them. Ask anyone in this working class town what’s special to eat and they direct you to pasties. The Cornish pasties I am familiar with are a specialty of the California gold rush town of Grass Valley. In the mid 1850’s, Grass Valley was the largest mining town in California with a population of 10,000, smaller only than San Francisco and Sacramento. It was connected to Sacramento and Nevada City by the busiest stage line in the state. In the 1860’s, Wells Fargo ran three gold laden stages to Sacramento a day attracting renowned bandits to the mix of decent families, drifters and miners. Migration from Cornwall in the British Isle to Grass Valley began with the discovery of gold in 1849. At one time, three quarters of the population of the town was Cornish. They found work here in one of the oldest, largest and richest mines in the state. The Empire Mine ran from 1850 to 1956, producing almost 6 million ounces of gold, worth more then $100 million. Today it is at the heart of the Empire Mine State Historic Park. The Park contains many of the original mine shafts and buildings, the owners cottage and restored gardens and grounds that once surrounded a grand mansion. Pasties were a portable meal to be warmed over miner’s lanterns during long shifts underground. You would assume early Grass Valley pasties to have few ingredients but I found a list that includes Fish pie, Herby Pie, Lamby Pie, Piggy Pie, and Muggety Pie. Those we had in Sault Ste. Marie had a filling of small cubes of beef, pork, potato, rutabaga and carrot and when accompanied by gravy felt like a dish from the 1930’s. 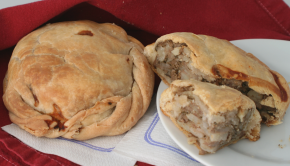 The Grass Valley Yellow Pages lists 4 bakeries specializing in Cornish pasties. They offer the traditional beef and potato as well as a variety of other fillings. Take some hot and enjoy this hand held meal while strolling the historic downtown of Grass Valley. And buy some frozen to take home as they hold and reheat well. The slang for anyone from Michigan’s Upper Peninsula was Yoopie (Yoo-pee), the way that the Cornish miners used to pronounce U.P. (for Upper Peninsula).